Jilla getting positive response from oversees releasing centers. The theaters over outside india are welcomed the pongal treat from Mohanlal and Vijay. The Screens become “Siva-Shakthi thaandavam”. Pongal 2014 is now become an ever big celebration mood. At first time Ilayathalapathy Vijay and Mohanlal coming together for Jilla, which is producer RB.Choudry (85th film). Debutant RT.Neason wear the director’s cap, while D.Imman scores the music. Jilla is the story of the sweet relationship between Sivan (Mohanlal) and Shakthi (Vijay) which turns sour due to a series of events.The movie begins with a classy intro for Mohanlal followed by a little flashback. But the real fun begins when Vijay arrives with a thunderous stunt scene. The first half traverses with comedy which is silly at times, songs at regular intervals and a few action scenes. The interval block is bang on, as Neason had a good twist in store there.Into the second half, and Jilla follows the tried and tested commercial movie formula. Songs, fights and punch lines galore, the circle of problem arising in one scene, and getting solved in the next swirls for quite a number of times. Although there are some scenes which are absolutely hair raising, there are a few which will make you squirm in your seat. The twists at the end too, are predictable. Vijay keeps the tempo going with his funny mannerisms, which do go over the top at a few instances. It is doubtlessly an enjoyable performance though.Vijay’s wardrobe deserves a special mention. Mohanlal who grabs the majority of the screen space in the first half is mighty as he fits into the role of the character pretty well, and excels in his Tamil diction. Kajal is cute, and looks like a dreamy girl in the song sequences. Out of the supporting performances, Mahat Raghavendhar is a charm in his pivotal role. Poornima Bhagyaraj, Niveda, Sampath Raj, Pradeep Rawat and the others fit the bill. Dialogues by N.Baskaran are good, albeit sounding too punchy when it comes to Mohanlal. Cinematography by Ganesh Rajavelu is appreciable, especially in the stunt sequences. Editing by Don Max could have much crispier, as it would have aided the lengthy runtime of the film.Although they lack sense, the stunts are visually worthy. Choreography in Jilla was a huge blow as Imman’s foot tapping music was brought down by the unimpressive dance moves. RT.Neason could have scaled heights with the story he had with Jilla. Mohanlal’s come back to tamil and his dialogue delivery with excel in tamil diction. Music by D.Imman is the kingpin of Jilla. The songs are already tring ringers amidst all stations. Bringing in almost 5 different versions of the theme, he has put in all his efforts to make the BGM stand strong. The screenplay however, doesn’t hit full monty and the movie ends up being a disappointment, baring in the mind the starcast and the production values. Second half is too lengthy and lagging somewhere. As a mass entertainer movie its length of 3 hours is too heavy. Nevertheless, nothing can stop Jilla from being a box office success, lapped up with glee by the fans especially. 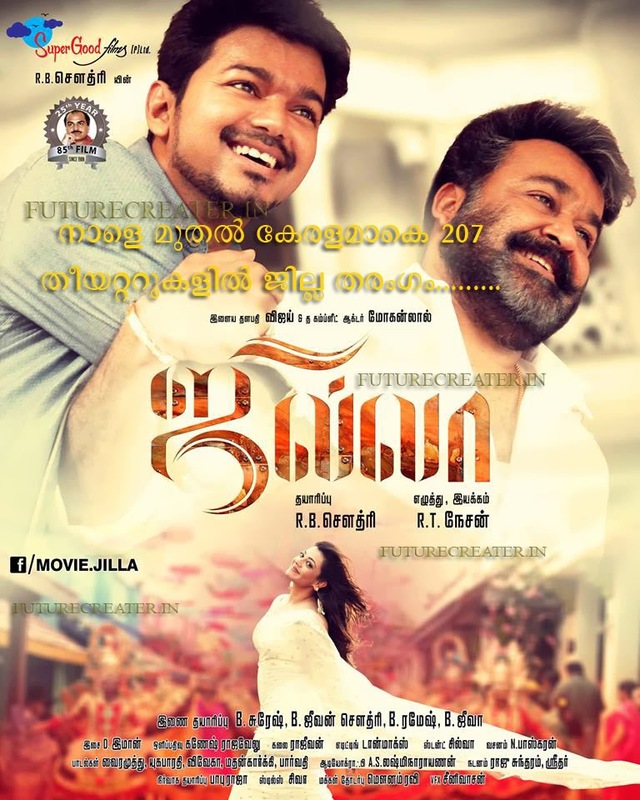 #JILLA is otherwise the average Vijay fare aimed at the mass, but his combination with Lal makes it worth a look. #jilla very typical masala movie.. May be fans will like, @Mohanlal has got v good screen space.. Thats the only +ve for me..
Jilla -> Its hightime that vijay should stop giving chances to new comers ...Nowdays vijay choosing the script rite but dir let down him ..
Jilla could have been better! Okayish movie! Din like editing and cinematography! Jilla is one example that Expectations just make you fall harder. #Jilla : Mass commercial entertainer :) Worth a watch..
Jilla paisa vasool entertainment it's vijay,cudn fig out anyone else,commercially big hit for sure. #Jilla-1.5/5,run of the mill commercial film.Nesan failed big time in using Vijay and Mohanlal's star value,disappointing attempt! #jilla Director nesan missed a big opportunity.. direction and screenplay are strictly average. Nothing new in the film. #The Contents above all are dictated by our entertainment experts. We are not responsible for any further gossips and issues behind it.